Looking for a Swarovski bracelet, or maybe you would like a bangle, no matter what you are looking for we will do our best in letting you know about the best Swarovski UK Black Friday and Cyber Monday deals. It is always great to look good, and this name will provide you with casual, party, romantic pieces you will just adore. Swarovski sells necklaces, earrings, rings and many other types of jewelry, as well as watches, gifts and more. But more important than that you should be aware this will be the page to land on when the Black Friday deals go live in November. 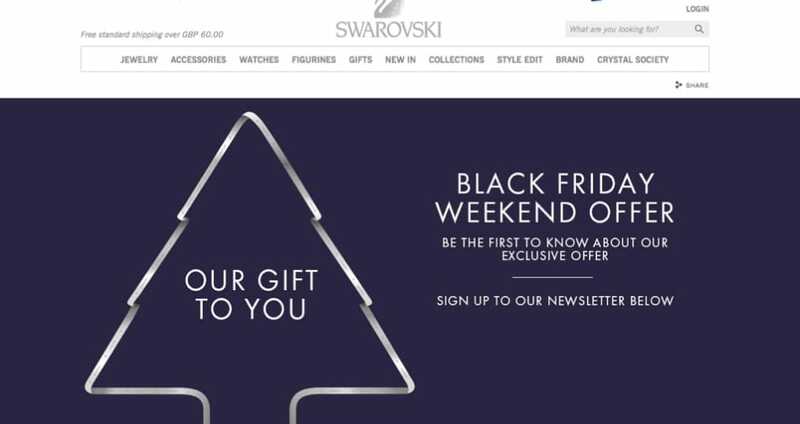 This is where all Swarovski UK Black Friday updates will be posted, opening times, online deals, top offers and more. There will be many discounts, the current price of the ‘Stardust Bracelet Set’ is £99, but this price could come down when the big event begins late November. The Swarovski Black Friday hub can be found at their dedicated page. If you spend £100 or more you can get a free sparkling gift – hurry though because this offer ends on 23 Nov. Anyone know what Swarovski will be offering as part of its Black Friday surprise? The Swarovski Black Friday sale ENDS today, any ideas on a Cyber Monday sale? The Black Friday deal was 20% off with any purchase, so whats the Cyber Monday deal going to be? I have been onto the official website Swarovski has not yet updated its Black Friday page, are they joining in on the BFUK 2016 sales this year? If you register with Swarovski today you will get a free 10% voucher for your next online purchase. Just sign up to its newsletter. Is Swarovski given away any good discounts for Valentines Day? You can get up to 30% off Swarovski necklaces, such as the one i just purchased. I got the Ring Pendant because i only paid £76 reduced from £109. When will Swarovski be having a sale again, and if so what type and percentage will be on offer? You can now shop the new Miranda Kerr Swarovski collection, the only downside is that I see no Christmas discounts as of yet. I so love the Swarovski Creativity Ring but i need for it to be cheaper than the current £119. So hoping Swarovski opens its doors a little early at the Mall in Cribbs Causeway, Bristol UK. When will you be letting us know what time the Swarovski Black Friday online deals will begin?